There has been significant media attention with regards to the legalization and regulation of recreational cannabis in Canada. At this time, it is expected that the federal legislation (Bill C-45) may be in place at the end of the summer of 2018. Our community has expressed concerns about how this legislation will impact the incidence and enforcement of drug-impaired driving in Halton Region. Impaired driving is impaired driving, whether the impairment is by alcohol or by drug. The Criminal Code of Canada does not differentiate between alcohol-impaired driving offences and drug-impaired driving offences. Driving while impaired by any drug is a criminal offence, and has been since 1925. In fact, over time, the Criminal Code has evolved in such a manner as to enhance the ability of law enforcement to detect drug impairment. Impairment by alcohol or by drugs affects information-processing, hand-eye coordination, judgment, concentration, comprehension, visual acuity and reaction time. These effects are readily recognizable and cannot be concealed by a motorist. 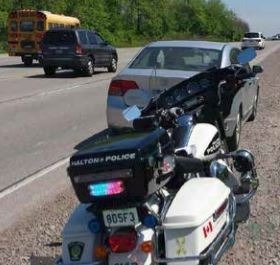 If suspected impaired driving is witnessed, a traffic stop will be initiated by Halton Regional Police Service officers. If a driver is suspected of being impaired by drug, specially-trained officers will conduct a roadside standardized field sobriety test (SFST). The SFST is a physical coordination test battery used to determine if there are probable grounds to conduct further testing. If there are probable grounds to conduct further testing, an additional 12-step evaluation will be conducted by an accredited Drug Recognition Expert (DRE). If the DRE officer has reasonable grounds to believe that a suspect is impaired by drugs, they are then authorized to demand a blood, urine or saliva sample from the suspect. It is on the basis of the results of the DRE evaluation that criminal charges related to drug-impaired driving may be laid under the Criminal Code. The impending legalization of cannabis will not have an effect on how HRPS enforces drug-impaired driving. Our Service will continue to use the SFST and the DRE evaluation to apply the Criminal Code. Current penalties for drug-impaired driving range from a $1,000 fine on a first offence to 120 days of imprisonment on a third or subsequent offence. Drug-impaired driving that results in death could result in life imprisonment. There is a prevalent misunderstanding amongst some adolescents that driving high “isn’t that dangerous” and even “makes one a better driver”. In fact, driving high impairs all the cognitive abilities needed for safe driving. Impaired driving is the leading criminal cause of death and injury in Canada. Community safety is a shared responsibility, and we encourage residents and visitors to continue to work with us to reduce impaired driving. Impaired driving is considered a crime in progress. If you witness suspected impaired driving, please call 9-1-1 to report it. Our speaker this weekend at my car enthusiasts club is a retired Metro Toronto Police Officer. His presentation will deal with Impaired Driving by alcohol and drugs along with a few traffic law updates. He will be demonstrating the Drager 5000 most likely never seen by the public that will detect drug consumption from a motorist. Contact me if you would like more info.